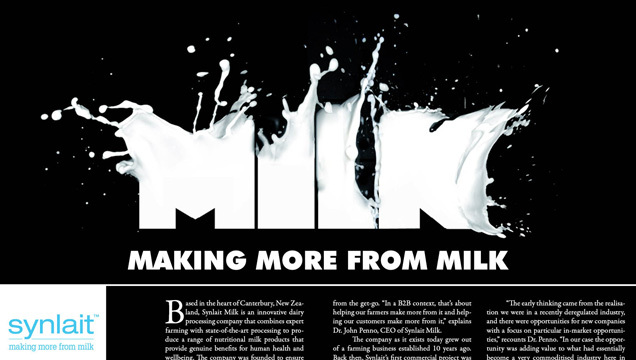 Based in the heart of Canterbury, New Zealand, Synlait Milk is an innovative dairy processing company that combines expert farming with state-of-the-art processing to produce a range of nutritional milk products that provide genuine benefits for human health and wellbeing. The company was founded to ensure that global consumers were able to access the best that New Zealand dairying had to offer. They are a business-to-business (B2B) company that produces value-added milk powder ingredients. The name Synlait comes from Synergy and Milk, and the idea of “making more from milk” has been the company’s mission statement from the get-go. “In a B2B context, that’s about helping our farmers make more from it and helping our customers make more from it,” explains Dr. John Penno, CEO of Synlait Milk. The company as it exists today grew out of a farming business established 10 years ago. Back then, Synlait’s first commercial project was the purchase and development of the Robindale farm in Canterbury, a site which quickly grew to a 3,000 cow dairy farm, one of the largest and most innovative of its kind in New Zealand. 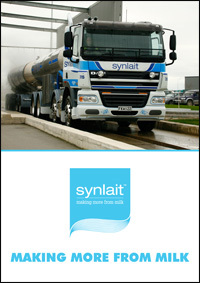 By 2005, Synlait owned eight farms and had the cornerstone block of milk supply they had been striving for. Synlait brought together a world-class team with a wealth of dairy industry and global business experience, and the business took off from there. “During the first year of the company’s life we went from being a dairy farming business with ideas to become an integrated supplier in the international markets to suddenly a milk processing and marketing company that happened to have a few farms in the portfolio,” Dr.Penno explains. When working for these customers, Synlait have the capacity to tailor-make their products to abide by their specific requirements – that is how the vast majority of their powder products are made, for example. While they do have some standard, non-custom products available, they are actively working on minimising those because of the superior margins seen with tailored manufacturing. “If I walked into the manufacturing plant today I would see on the wall who we’re making the product for, what the specifications were, and I would understand the unique things we’re building into the product for that customer,” Dr.Penno explains. This culture is reflected in their people, all of whom have extensive experience across all areas of their supply chain – from farming and farm management to manufacturing and product development all the way through to sales and customer service. This wealth of expertise ensures Synlait is offering their customers the very best in terms of service and quality. Another way Synlait ensures their offering is top-notch is by integrating every part of their supply chain, from their suppliers to their state-of-the-art processing, to their customers. They work very closely with milk suppliers to make sure the quality of their milk is superior, and provide training programmes and access to on-farm expertise in areas such as quality and environment management. “In terms of minimising environmental impact, we would argue that in our supply agreements we have the highest standards,” Dr.Penno says. If they find their suppliers are not meeting their standards, they will work with them to help change that, but are also not afraid to terminate an agreement altogether. “It’s something we take very seriously,” he says. That commitment to environmental best practice applies to every link in the company’s supply chain as well. Later in that chain, for example, Synlait’s wastewater is carefully treated and actually goes on to be reused in their farming system. “We’ve put a lot of effort into that. All across the board, we try to do what we can to be operating at best practice,” says Dr.Penno.The company has this focus both because it is the right thing to do in terms of sustaining the planets natural resources, but also because they earn efficiency gains as a result – so there is a practical element to it, as well.